Well, since we recently caught them on tour with Lordi, it would have been rude not to throw our Band of the Day questions at this Swiss bunch. We are from Switzerland, in the French speaking part. I played with Kurghan for 10 years as we were already part of other bands together before the Silver Dust era. After a few line-up changes, Tiny Pistol joined the band. Recently, Magma, our new drummer, joined the band as well. We chose it in relation with the universe of the band. 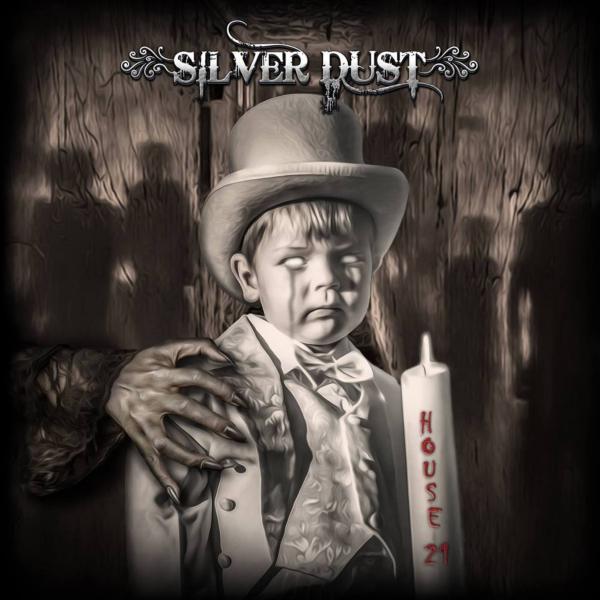 In the past, silver dust was used in white and black magic recipes so it is perfectly aligned with the concept of the band that navigates between the good and the bad. We mainly listen to rock but also to other styles of music. From a theatrical perspective, our influences come from Tim Burton’s movies and Jules Verne’s books. Everything! We try to create our own universe that makes us unique. For instance, we have a “magic mirror” on stage where we project images that help to immerse the audience in our world. Our music is also often qualified as unique. Our last album, House 21, is a concept album. It tells the story of a soldier who is battling in the Second World War and decides to leave the battlefield and runs for many hours. He finally arrives in front of a strange and gloomy dwelling: the House 21! In the course of his stay, he will meet a large number of people. All of them are wandering souls, dead and sentenced to stay in this house for eternity. Since 2013, we have played about 200 shows. Our live show is very visual so that the audience is fully immersed in a magical atmosphere. There are also interactions with some actors who come directly on stage with us. Some of them are also present in our “magic mirror”. Come to see us, you will be surprised! We have some fans who have a Silver Dust tattoo. It’s a great honour! I play Ibanez JEM, Steve Vai’s model, with a special LED kit on the neck. Tiny Pistol plays LTD guitars, the Eclipse series (7 strings). Kurghan plays Fender Jazz Bass. Magma plays on a Pearl Drums kit. After our current European tour with Lordi (35 gigs), we will start to adapt some of our songs for unplugged shows. In addition, I will start to write our new album. In 2019, we will of course continue to perform everywhere throughout Europe. We would love to open for KISS, Iron Maiden or Guns N’ Roses. And if we could give a band the chance to open for us, KISS, Iron Maiden or Guns N’ Roses would be good candidates too!